His farm background predisposed Tom Manley to his current business, Homestead Organics located in Berwick, just south-east of Ottawa. His parents, Murray and Carry Manley, operated a dairy farm which was awarded to the family by the Crown before Confederation. They sold the dairy farm, switched to cash crops and were certified organic in 1988. Eastern Ontario lacked organic infrastructure, so Murray operated his own grain cleaner and rudimentary feed mill in the old dairy barn. As organic production grew, more farmers needed cleaning and milling offered at Homestead Organics which his father ran alone: it was simple, low volume, and small scale. The name Homestead Organics comes from the Manley farm. Tom had been working with Bell Canada launching the Bell Sympatico Internet system and was looking to be his own boss. His father was thinking of retiring. One day in December 1996, Tom saw a for sale sign at the local shut-down feed mill. There was only the shell but the structure was sound. The decision was made and it turned out to be a good one. Tom would run the processing transferring the equipment from the barn and building on the base of existing customers. His father would stay on the farm. The official opening was September 1997. The business offered two basic services: grain cleaning for food processors and mixing feed for livestock. Part of the company's success related to the need for an intermediary between organic farmers and food processors. Farmers may harvest 7 tonnes or 30, and the crop may contain weeds, insects and stones. The food processor specifies 20 tonnes, cleaned and in bags. Homestead Organics provides the cleaning and batching services to meet the processor's specifications. Also, bagged feed is provided throughout Ontario, Quebec, and Atlantic Canada, and bulk feed within a day's drive which includes some of New York State. Basically the service is local with no overseas export. This leading farm supply business is unique in Ontario because of the range of supplies and services of a one stop farm shop. Both suppliers and customers are fanners. An organic farm store has been added supplying seed for field and garden, livestock supplements, organic fertilizers and pest controls and food such as flours and grains but not produce. The food stuffs are brought in from Canadian and foreign processors and distributors. With some exceptions such as lime, common items found elsewhere such as hammers or harnesses are not sold. The business model is similar to a conventional farm supply store, except for the organic focus. Grains received for food and feed uses are food grade soybeans, feed soybeans, corn, barley, wheat, oats, peas, and buckwheat. "Farmers pick my brain all day long about market situations, cover crops, yield problems or supplements. Some will translate into sales but a lot is generic education and sharing of experiences, information learned second-hand from other farmers and attendance at conferences" said Tom when asked about the advice service offered. Organic farming is management and knowledge intensive and organic farmers have fewer sources for information. The book From Field to Feeder ($20), published in-house, provides advice for natural health programs and nutrition for backyard flocks, hobby herds and mixed farms for a range of animals such as dairy cows, goats, wild game and chicken. Tom says the biggest demand is for phone numbers of which he has a few thousand..
Well known for his role as Deputy Leader in the Green Party of Canada, he resigned to run as a Liberal in the riding of Stormont-Dundas-South Glengarry in the January 2006 federal campaign in the hopes of gaining a seat so he could translate talk about sustainability into action. Disappointed at coming in second, he is considering how to stay involved. Transportation is expensive for long distances. If a farmer is local and has smaller quantities, he can hitch up the tractor but if he is further away, then a reasonable quantity for a truckload is 30-35 tonnes: The farmer will have to plan a crop rotation to get the desired number of acres and fill a truck. Quality is an important issue. Tom said they look for good bushel weight, good visual appearance and absence of mould. Typically they require a laboratory sample for protein and they verify com and soybeans for GMO contamination. Organic food and feed grade grains require a much higher quality control than conventional grains. Control is a costly issue involving sweep-out, cleanout, and flushing in what is both labour intensive and technically complicated. Tom talked about the example of the installation of the filling system of the tall grain bins. Parts of the system had to be torn out and redesigned because the conveyor never quite empties and results in a 1% "contamination" by grains other than those specified, unacceptable to food processors. Homestead Organics is a private business with Tom as the only shareholder. He has found some innovative ways of raising capital especially as processing was ineligible for loans from the Farm Credit Corporation. Only the Bank of Montreal gave a limited loan under a loan guarantee by the Small Business Loans program. Banks think of organic as a novelty, "an unproven business in an unproven market with an unproven concept." Needing about $600,000 for infrastructure such as equipment and expanded grain storage, Tom requested capital from farmers, friends, families, strangers, and suppliers including notices in the newsletters of Ecological Farmers and Canadian Organic Growers. The response was good raising $100,000. Community-based funding was not enough but loans became available from the federal Business Development Bank which identified organics as an emerging market which fit into their mandate. An angel investor with great confidence in the organic sector also invested as a non-voting Class A preferred shareholder. Of course, servicing the debt is a cost which affects the future direction of the company. In 1997, the facility handled 500 tonnes with Tom as the sole person with occasional help from his father. Tom could keep everything in his head. Now with sales of $2.8 million, 4000 tonnes in volume and 7 people, it is harder to avoid mistakes. Tom said this means more documentation, procedures, and checklists. The current challenge is computerizing the business with a file server and high-speed Internet access for such information as recipes for feed mixes, work orders, billing, coordinating transportation and production, maintaining stock inventory. His work experience at Bell helps him develop essential aids to improving efficiency and quality of service while reducing frustration on the part of the employees and customers. The project hopes to ensure that when an order comes in for barley in a feed mix, the staff never has to say "Aw shucks gee, we're out of barley." Small scale organic farmers often have difficulty finding organic feed. Tom encourages people who phone for small orders to ask their conventional feed store to order from Homestead Organics in sufficient volume to make it worthwhile to ship. The farm supply stores then become dealers. They are supplied with a display rack, signs and the feed along with a commission. 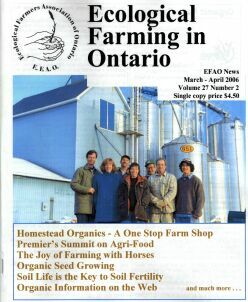 The web site (www.homesteadorganics.ca) lists current dealers across Ontario with an invitation to others to carry the products.